No other viable thermal power alternative? They mean besides nuclear power the one providing 5.7% of total global energy demand right now. Suddenly, changes to gas prices would have less impact on Australian pool prices. Suddenly, Victoria would have a new zero-carbon baseload replacement option for 2030 and beyond. Rising gas prices over the longer term would not drive the perverse result of black coal importation to one state from another in a country that is supposed to be pricing pollution. Power prices for Australian homes and businesses would sit steady from plants that are sensitive to neither fuel prices nor carbon prices. We are getting this so, so wrong because we are pricing emissions without permitting a major technological player help us optimise the result. The losers will be Australian households and businesses. Oh, and our climate upon which we depend for everything. Lest we forget. PS: There is a punchline, not as if this needed one. Section 3.1 General Assumptions of the modelling states: “The market is assumed to operate to maximise efficiency and is made up of informed, rational participants”. ZCA won’t like the implication solar thermal is not viable. Noteworthy snippet on ABC Great Southern Land last night. Underground black coal mining supervisor in NSW said when coal’s time is up we will have to change to something else. Joe Public is a step ahead of the politicians and media. At least the capital cost of that technology is listed section A.5.2 ($6,500 per kW without storage, $9,500 per kW with storage) along with biomass, wind hot rocks geothermal ($7,000/ kW) and all conceivable permutations of coal and gas. As usual, an Australian report pretends that nuclear power does not exist. There is a good legal reason for that, it can’t exist ;). That’s why when BREE does a study including Nuclear it’s a big thing (even SMRs! ), otherwise it’s a “why bother, it can’t exist” attitude to inclusion. That great southern land show, all they could say about coal was “oh it’s dirty”, and “it’s running out”. As if you can encapsulate all that’s wrong with coal from a climate change perspective in the one little word, “dirty”. Like it’s a bit dusty or something. There were a few non sequiturs on Great Southern Land. We were told three quarters of homes now have aircons hence the need for peaking power. Then they cut to wind farms apparently powering squillions of homes. I guess those aren’t the homes using aircon during heat waves . Forget 5% emissions cuts over 20 years and minor efficiency gains; unless gigawatt scale coal baseload is replaced we are just playing silly buggers with greenhouse reduction. My fear is that key politicians (eg Wayne Swan), media darlings like Flannery and top bureaucrats seriously believe that wind and solar can replace coal. Or maybe they haven’t thought about it that hard. We appear doomed to waste several election cycles working this out while adding billions of tonnes of CO2 to the atmosphere. Meanwhile we could be building one of those nice CANDUs. Or high pressure zones, which occur on hot, dry, still days and tend to sit over the entirety of SA. AEMO says they provide 5% of peak power in Summer. Surely the occurrence of these pressure zones is a higher outage risk than a broken gas pipe. All, and especially Ben – you may already be aware of the Thorium Power Generation petition on CommunityRun. It’s one of four nuclear petitions listed at Thorium Petitions. I think it’s a good idea to sign the petition, and add a comment that expands the idea to include all forms of nuclear energy, not just electricity generation, and doesn’t specify a particular fuel. We need everything, and we need it now. The LFTR is one of a class of nuclear reactors called Molten Salt Reactors (MSR). I call for inclusion of all types of MSRs in this investigation, using uranium, thorium, and other actinides as fuel. The investigation should include MSRs as sources of all types of industrial heat, not for only the production of electricity. I also call for design and construction of research reactors and commercial prototypes. It is time for action. I haven’t attempted to sign the other three petitions, but I intend to. And the possible internationalization that that implies makes me think that we can call for a multinational effort. I apologize for being somewhat sideways of the subject of this post, but I wasn’t sure how to contact Ben to let him know about this. I don’t mind that posting at all Andrew. The ABC Media Watch website has put up what appears to be an excerpt from the SASDO2011 report. Other parts of that report showed 525 MW geothermal generation in the Simpson Desert and completely omitted the word ‘nuclear’. The last paragraph of the excerpt says that windpower has reduced SA emissions. What you would expect with wind and gas together making up 70% of generation. Now in 2012 wind penetration is something like 33% I believe. What happens when the SA gas price doubles perhaps within a decade? From memory the CANDU requires something like 2% enrichment as opposed to SMRs with 4% I believe. The initial fuel rods for SMRs would be imported (preloaded?) probably from a US manufacturer. Fuel preparation is one of the processing jobs the Greens MP .probably didn’t envisage but it could make sense. The OD expansion needs 650 MW of new power. SA’s gas baseload system will soon need replacement. That’s where the jobs will be. Every nation that uses CANDU manufactures its own fuel… jobs. Good, high tech jobs. However if a light water SMR comes on the market that can be running inside 12 months I would go with that first. Not to mention the need to make heavy water, which requires engineers and technicians to operate a D2O plant. I’m impressed if 80 people actually walked all that way without hydrocarbon assistance. I note ‘Dr Karl’ has endorsed solar thermal for SA as have the Climate Commission for Qld. Can we infer that these voices of authority don’t approve of nuclear? It’s equally noteworthy that the media don’t seem to have picked up the bat. Perhaps SA is weary of high power prices and expensive schemes that don’t work out such as geothermal. I agree that Pt Augusta is at a pinch point between eastern and western Australia. However sea water cooling of any large thermal plant is complicated by high summer water temperatures approaching 30C in upper Spencer Gulf. See the satellite heat image in Appendix A of this pdf link. Have just caught up with your last few blogs Ben. You’re doing some great work. I spoke to Engineers Australia SA Branch a few years ago and the Retired Engineers here in SA in February. My pro nuclear talks to Adelaide and Gawler Rotary clubs last week were very well received. There is plenty of support for nuclear amongst the public. And there are more and more people who want to know more about it. Unfortunately, most of the support comes from the middle aged to elderly. We need to reach the misguided youth whom we saw on the Solar March yesterday. I’m targetting them in November when I take a group of 20 year 11 students on a Mining Tour of Eyre Peninsula. I’m planning to involve Uranium SA and their site south of Whyalla on the tour. I shall be challenging the kids to confront the reality of nuclear power AND the essential good sense of including it in their emissions-free energy future. I’ll be recording my fourth and final Ockham’s Razor talk for ABC Radio National in the next few weeks. I’m hoping my third talk on nuclear waste will go to air before year’s end. After 14 years, I think I’m now making good progress. Keep up your good work Ben. Sometimes it feels really hard, other days it feels like real progress… but thanks for the reassurance and support. Yes, I do feel like I am getting a steady flow of strong opportunities. What I am really still trying to master is how to connect with and hang on to more people that hear me speak. That way we might collectively mobilise to do something useful more effectively. I’m experiencing a good spread of interest across age demographics which is encouraging. I have some more comprehensive discussion on the whole Repower Port Augusta proposal coming up fairly soon. As ever, I’m perfectly cool with a good hard look at all zero carbon options to replace fossil fuels and picking the one that give us the most mitigation per dollar we have to spend. More on that in coming months. But thanks for the link. It is pretty hard to get anyone to hit the streets in the name of anything, but I would have to imagine the turnout of 300 people is not really the broadening of the support they would have been hoping for. Something that grabbed me in the link was the suggestion that Alinta are supportive. Those saying so are either dreadfully naive or happy to spin like crazy. Alinta would be very supportive of anything that calls on the full weight of a range of subsidies to get up and running; supportive right to the point where it does not interfere with their profits, and where they can bask in the nice green glow of a project they do not pay for. To suggest that they have some particular interest in solar thermal… I mean really. All this needs is one decent journalist to ask a few pointed questions of Alinta as to what their current plans are for Pt Augusta. I bet you they are not planning to either build solar or quietly shut down and go away… they will be working out ways to keep those coal assets running and profitable for as long as possible. Apparently upon meeting with Minister Koutsantonis (their twitter feed mentions the meeting) they didn’t get the “government chip-in” they were expecting. They were rather quiet after noting they were going to have a meeting with the Minister. Welcome to the real world of getting governments to “fund” or “chip-in” on projects. Alinta have said nothing of the sort. There was a mention of a possible move to a solar boost project (like at Kogan Creek PP) but at the moment is is cheaper for them to run with coal under the carbon schemes in place and the drop in current coal prices. The Solar Thermal deviation was due to a short article (word limit) from the ABC online news mentioning a solar thermal option without specifying the technology. RPA assumed it was their Solar Thermal. When it was more likely a Solar Thermal boost option i.e. Kogan Creek. IIR the people who walked some or all of the 250+km wanted CST with molten salt storage plus some windmills for cloudy days. That’s nothing like a tacked-on solar steam boost for existing plant. I also seem to recall Alinta saying they were getting out of generation, just electricity reselling. The significance of Pt Augusta is that aside from the Whyalla coke ovens it is the westernmost large thermal plant in the east Australian grid. When eastern Australia has run out of gas an HVDC cable across the Nullarbor to gas rich WA could be helpful. Along with yellowcake shipments Pt Augusta has to be part of the action but I wouldn’t put a nuke there rather on open coastline instead. Reasons being? Can’t be water temperature concerns, the coal plant already uses once through seawater cooling. Alinta has a retail and generation arm. I can’t remember what they renamed the company that runs Northern and Playford to. Alinta is doing retail but they have subsidiaries (IIRC) that run generation assets. The Solar for Pt Augusta and RPA walkers were walking for just the Solar Thermal option (the RPA report isn’t clear on the storage) and kept pretty quiet on the wind component. Even looking trough their media page, they are very light on the wind component. I even saw comments on their blogs referring to the 4000 votes they got in favor of Solar to have a bias in the text on the “Solar or Gas” voting slip (note no wind). I don’t even think it wil be a molten salt version rather just a steam cycle, but the report is fairly light on so who knows! Note “addition to”, thus Kogan Creek solar boost project is more likely. The people at RPA and AYCC saying that the company is behind their plan for Solar Thermal (central tower) is disingenuous and either a deliberate attempt to affirm their agenda, they are naiive, and/or have no clue about the technology they are talking about. Is there someone in the AYCC organising committee that has studied engineering? It doesn’t look like it. More so they are all people wanting to be on the next preselection ticket for the Greens party. Even RPA’s Gas component in the report bothers me as they cite Varnus Island explosion in WA as something that could happen in SA, with a weak veneer of “Energy Security” wrapped around it. The seem to forget that in 2004 there was an explosion in the Moomba processing plant that shut down supply from Moomba and we had sufficient supply due to the SEAGas pipeline from Victoria. Clearly you can tell that the report was written by someone outside of the state and has no idea of how energy markets operate. Somehow coal seam gas is going into Pt Augusta, do they even have a pipeline map of Australia!?. I understand Gas is a bit of a taboo topic on DSA but their portrayal of it as an energy security risk and misinterpreting a SANTOS ppt slide (which they put in the report; wonder if they got permission?) was so so wrong. Dan, point 2, jolly good. Point 1…sorry can you be clearer please? The RPA website says “The local community, the council, local businesses and the power company all want solar”. The statement quoted at the walk was “The Port Augusta locals want it, the company that runs the dirty power stations at the moment wants it”. You, however, say “we’re under no illusions that Alinta with current funding options are looking at a full scale replacement”. Do you mean of coal with coal, or coal with solar? “they are however undertaking feasibility studies and meeting w/federal govt this week”. Is this for doing something with solar? I take it they are not meeting the Government for tea and crumpets, they are looking for money, yes? I am open to correction. I don’t want to misrepresent. But I do not see how the two statements quoted from RPA accurately represent the position of Alinta. “Alinta chief executive Jeff Dimery says a pre-feasibility study has been prepared and with federal help a solar-thermal plant could be built within four years. “I think we all want to embrace the future and you have to start somewhere,” he said. Let me put this to you, much as I put it above. Alinta are not supportive of solar thermal. Nor are they hostile. They are happy to do it if someone else will ensure it is as good a deal or better than continuing with straight coal. Right now, what they really seem to be looking at is co-opting this technology, “with federal help” to prolong the life of the coal assets. That outcome, in 2012, would be a complete disaster. Public money would be used to add a green veneer to fossil fuels, give these plants decades more life, when what we need to do is eliminate them. What is your position on this proposal? Would you support it? Did Alinta’s senior management make some representation at the Walk Against Warming? Have you a statement from them of support for your proposal, not their proposal? Good to see you’re engaging with the discussion Dan. Where the issue arises is with the language used. You say “full scale replacement” but in the media (articles Ben and I linked) the CEO of Alinta Energy states “in addition to [coal]”. If the language was different there wouldn’t be much scepticism. I have a feeling that the passion and ideology for one plan has taken of reason and rationality. Did anyone in the AYCC or RPA group stand back and have a look at the proposal put forward by Beyond Zero Emissions? It has some glaring holes for a report that is being touted as “the solution” and used to convince residents to vote on (btw where was the wind option on the slip??). It is exactly like a politician releasing a document in part while not publishing the ugly bits to make something look better than it is. That’s why I asked where the engineers were in the AYCC. Did you ask Engineers Australia to have a look at it? Or even the Australian Institute of Energy? The AYCC is a good organisation, I just wish it left political ideology at the door and looked that the Climate Change problem with a full scope. Anyone who sees Nuclear, CCS, or any other option that is not Solar or Wind (possibly Geothermal) as a part of the solution to fighting climate change is pushed aside for “the greater good”. Correct me if I’m wrong here, I’m open to all possibilities. Interesting observation Terry on the generational perspective. However it is said Gen Y born 1979-1993 have no ideological axes to grind. Views held at a young age can change recalling that Rann went from a Mururoa Atoll A-bomb. protestor to a supporter of uranium mining, oddly perhaps not so much of nuclear power in SA. Despite older trendies like Dr Karl and Tim Flannery now endorsing cost-is-no-object wind and solar the rest of the establishment doesn’t. That includes Ferguson and seemingly the mainstream press. The Walk for Solar seems as good as forgotten. People power can overcome certain levels of cost disadvantage. I think this proposal is probably outside of that ball park. To avoid 3rd level indentation I’ll put my 2c worth here. There are two major reasons to prefer open coastline over upper Spencer Gulf for new thermal plant. The first is summer SSTs like 22C on the Bight with the Leeuwin Current as opposed to 27C high in the Gulf with mainly tidal flushing. Less pumping required for the same delta T or cooling in summer. Second is co-location with desalination plant. The brine discharge will make the gulf even more salty. Recall the late Stephen Schneider wanted to harvest salt there with a solar desal rather than send back the discharge. The proposed water pipe Whyalla-Olympic Dam was about 325 km if I recall. Ironically Woomera just 70km from OD gets River Murray water. By open ocean I mean not only Ceduna on the bight but the lower gulf such as near Uranium SA’s prospect at Cowleds Landing or even lower down. However Ceduna is part way to WA (where the best gas is) and just 350 km from OD. Santos have said natgas, coal seam gas and their one Cooper Basin shale gas field will all feed the LNG train at Gladstone Qld since Japan now buys a third of global LNG post Fukushima. I also recall that a new open cycle gas plant (800 MW?) was to be built at Tarrone Vic drawing from the SEAgas pipeline. If they start fracking down that way there will be an outcry. 2) SA is on borrowed time with gas supplies. Not content with the world’s third highest power prices SA now wants to check out solar thermal with storage. That would be the same solar thermal with levelised costs in the range $200-$300 per Mwh for 70% capacity factor. That would also be the same SA with perhaps 40% of the world’s easily mined uranium. MP Koutsantonis once thought SA should have a uranium enrichment industry then he thought gas was the answer. Note that it takes a US businessman ( the CEO of Dow Chemical) to point out that we are squandering our gas reserves. It is indeed as if politicians are blindfolded .. they seem to need to blunder into every dead end. This is the motion for the committee. It lists what they will investigate and the speech is the reasons why. Seems the BZE Repower Pt Augusta report is the origin. They might get a rude shock when they find out how costly it will be. You are correct John with the LCOE, not sure about the Capacity factor though. I thought Andasol-1 was only 40% with 8hrs of storage. In my opinion Northern and Playford (or Flinders; as Alinta calls it) will either go to full Gas, or an Integrated Solar Combined Cycle. Unless the Nuclear option breaks the barrier. There is optimism in that Dan van Holst Pellekaan has said in the past that all the options should be looked at “from solar to nuclear.” (in July IIRC), but Dr Susan Close is on the committee and she is left faction ALP and is against uranium enrichment (which Koutsantonis has mooted before) and nuclear power. Although she may not be but that is the default position of the left faction. ALP right tend to be warmer to Nuclear than the left. It all comes down to the committee looking at all the other options, as they can in parts (e) and (f). I suspect 50% of the SA public is receptive to nuclear (after all it had Maralinga and now uranium mining) but a few well placed individuals have the politicians spooked. The engineering prof. interviewed on ABC radio is another example. I note they pick and choose their economic arguments in a way that politicians aren’t savvy enough to question. Aside from the Whyalla coke ovens Pt Augusta is the western edge of the NEM grid. If they had a gas fired plant perhaps they should use air cooling since upper gulf seawater is both saltier and warmer than elsewhere. I note yesterday the Premier visited the Moomba shale gas play now connected by Santos with promises of bountiful. supply. Somehow fracked gas has gone from 6,000 years of reserves to 40. Earlier Santos have warned it will be expensive. Therefore the alternatives of CST, gas or a solar-gas hybrid will all be costly. Recall the original Olympic Dam expansion plan called for a 250 MW gas plant at Roxby Downs with the rest coming from the grid, both sources now problematic. SA is up against it with high energy costs likely to depress the economy. If only there was an SMR ready to go. Power prices will still be double what they were less than a decade ago. The cut of $27.20 per Mwh could be just 10% or so of what it will cost to make electricity at a solar thermal plant at Pt Augusta if it ever goes ahead. The main issue is that of micro-management vs broad brush regulation of the energy sector. In Australia we have interference by State pricing regulators. In Europe there is this new idea to pay fees (‘capacity markets’) for generators to remain on standby. No wonder AGL are peeved. A price cut seems daft given that the gas price is likely to escalate. Gas is or was 44% of the SA energy mix and the enabler for fickle wind and solar. Santos are pleased with their pioneering shale gas field but a year ago they were saying the price must go up. The SA Essential Services Commission is like the Roman emperor who decreed.’let there be cheapness’. Their credibility is on the line if they get rebuffed. Just a heads up on a public throw of support to nuclear power. Careful or Queensland will get a run on..
Tell be about it. Like Tasmania coming first on gay marriage. Talk about the dark horse. I’ve noted it a couple of times before; there is a strong undercurrent of preference for nuclear on the right. Not necessarily for the same reasons that you do, not significant enough to take the electoral hit for it without a groundswell to back. Barnaby is one of those special cases we need more of in the absense of a better spread of political parties. Mavericks like him are able to say these sort of things and have them fly or crash with little or no cost to the party. Without that tell, nothing moves forward. One of the things I’m learning slowly is just how little scope the mainstream political party’s have for initiating change. Empowering, yes. Initiating, not so much. With Nuclear you pretty much have to baby step them through. There are the outspoken ones who are recorded in Hansard and the Media. However the rest are like the typical junior disco with all the boys on one side and the girls on the other. Bit shy and timid of taking that first step. Basically it comes down to showing politicians that their peers are for it, the other parties have support for it, and the public has a pro slant with a bunch of undecided. Then to point out the scientific and engineering experts who toll away in the labs designing, testing, and manufacturing safe nuclear reactors and their findings. These people work hard and don’t necessarily have the time for PR. There are two sides to the debate in Australia, those experts who see Nuclear as a manageable safe power source who work and study it every day away from the media spotlight, and those opposed who are out in the media rather than the lab testing their hypotheses with data, in other words a hypothesis surrounded in anecdote and assumptive opinions. One is heavy on testing and light on PR (pro), the other light on testing and heavy on PR (anti). The PR has to be bottom up as the anti nuke movement relies on their far left wing ideology to discredit those qualified who determine through scientific method a result that is contrary to the anti world view. Ziggy Switkowski was also keen on NP for Qld. Now we just need Clive Palmer and Gina Rinehart to see the problems with Qld coal, I wonder if reading between the lines the Libs in NSW would like the next Hunter Valley baseload station to be NP. That might have to wait til an old plant claps out since electricity demand growth has stalled. However I see no other alternative for baseload in Vic noting both Yallourn and Hazelwood put up their hand for ‘contracts for closure’. To be replaced by what? The opening of the new Snowtown wind farm takes SA to 10% penetration according to the ABC. What about the other 90%? Tas Hydro is doing well on the spot market shame the Basslink cable is normally limited to to 500 MW transmission because excess wind energy could have been stored in dams. Down here in Tassie we could use probably 500MW of nuclear to provide some baseload capacity to enable the hydro and wind to be used to best advantage. And we need to get back to putting the Olga dam in and running a second genset on the flow out of Strathgordon. Between them that would see us energy secure for the next generation and the Basslink cable able to be used how it was originally intended. My idea for Strathgordon (60% full) is to build an off grid wind farm at Low Rocky Point and send unregulated power 45km to the dam. There pumps with variable speed motors return outfall water back to the lake, The turbine room has a vacant slot for another 150 MW generator so even La Nina didn’t max out river flow. Wind can also compensate for sluggish water flow on a makeup basis, the point I believe of the Waddamana substation. I suspect that support for nuclear in Tassie is the lowest of any state, given that the Australian Greens movement sort of originated down there. Feel free to correct me in that one, though. One thing to note is that the Greens are quite opposed to Basslink as it stands now, as it enables Latrobe Valley brown coal power to be imported into the ‘clean’ Tasmanian grid. I have an alternative proposal to putting nuclear power in Tasmania – build it in Victoria at Portland and put in a 500MW HVdc link from the Otways (around Mortlake) to around Burnie. You see, AEMO has been running a study on a combined HVdc and HVac network augmentation called NEMLink that would effectively remove most large power flow constraints from the National Electricity Market (east coast + SA + Tasmania power grid). This particular HVdc link is identical to one proposed as part of NEMLink, however it was removed from analysis as being uneconomical. Of course, if you have baseload nuclear on one end and significant wind power expansion on the other, you might be able to get the economics back to Basslink-grade. There are a few pro NP people in Tassie which is quite consistent with being opposed to old growth logging for example. Some sites like Trial Harbour or Ironhouse Pt seem ideal for NPP. I’m told if the tungsten mine on King Island had re-opened an underwater AC cable would have been laid since their wind charged battery experiment was inadequate and a failure. I understand a new cable under the whole of Bass Strait would cost $1bn or more. I’ll check out this NEMLink I wonder if it overcomes the problem of restricted flow reversal in HVDC. NEMLink is covered in the AEMO 2010-onwards National Transmission Netowrk Development Plan (NTNDP), although it’s presented in a fairly low-detail, high-concept manner. As for restricted flow reversal, there’s not much you can do about it when you have a long-distance submarine cable – line charging is always going to be an issue. Mind you, if you put in a second Basslink then you can run the two cables in opposing power flow directions to get a complete ‘circuit’ for optimal continuous power flow. The only problem with that is that wind is still twice as expensive as normal supply. Sure, Tassie can deal with the vagaries of wind power due to its preponderance of hydro; still not a great idea to use power supplies that are more expensive than necessary unless there are specific benefits to doing so.. The Olga dam would be the cheaper and more capable option. Nuclear baseload would remove any concerns regarding water supply, and the pump back you describe could be used for peak load. 3) likely endorsement of the Renewable Energy Target. Several large generators and State governments pointed out the flaws in the RET but those views were evidently dismissed. More to the point the Climate Change Authority should concern itself with CO2, not picking technology winners and losers. Perhaps the CCA should approve coal mines as well. Even ecologists point out the lower Murray lakes would be saline were it not for 1930s earthworks. The option of demolishing those earthworks appears to have been ruled out. It seems some greenies are really conservatives in disguise. This is the kind of of ditzy thinking that will keep NP banned for another decade. Back to evens – not far short of a full recovery from the Fukushima drop. John – just interested – why on the south west coast rather than at Strathgordon? There’d be a lot more new infrastructure required (power, road, shipping). Strathgordon also has plentiful supply of cold, fresh water, and is a long way from anywhere. Other sites worth considering might include Poatina, Lake Murchison, Tasman Island, Musselroe Bay, Bell Bay. I wouldn’t want to place a nuclear power plant at a place like Strathgordon simply because it would be then sitting at the very top of a massive water catchment. Regardless of the actual risks involved (which are minuscule), it’s not a good place to put something like that. Bell Bay would seem to be an excellent place to put a nuclear power plant – there’s an existing power station site that could be re-utilised and nearby George Town is where Basslink connects with the Tasmanian grid. You could use a single EC6 to replace both the Tamar Valley and Bell Bay gas-fired power stations and to significantly augment the grid with additional power. 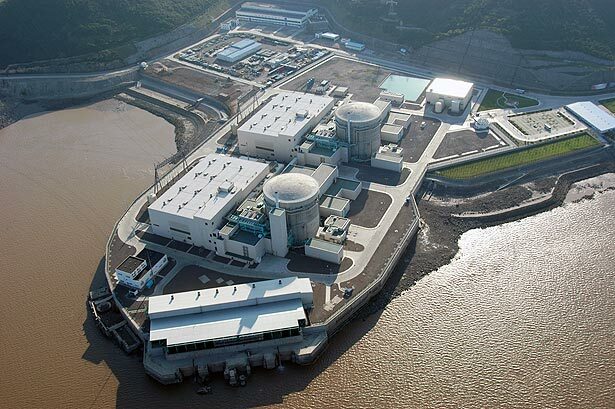 Of course, if you were set on converting existing hydro dams to nuclear power using their reservoirs as you seem to suggest, plopping down a few 45MWe NuScale SMRs at each site wouldn’t be too bad an idea. Sure there is a catchment downstream, but it is a completely unsettled catchment. Drop a 25km radius circle on Strathgordon, and there is very little inside it. Bell Bay would be good; it’s near major industry and is a power transmission hub. Just that it being in the Tamar Valley may introduce some issues; see the pulp mill experience. The idea with the hydro dams is not to replace them – there’s no reason to do that at all. But they already have access, infrastructure and cooling. And yes, the SMR concept would be ideal, whether it’s Nuscale or another type. It’s turning into Decarbonise Tasmania with a head start from 70% hydro. An interesting factoid is that one end of Basslink is George Town Tas the other is Loy Yang Vic brown coal fired power station, allegedly still the cheapest generator in Australia even if carbon tax doubled. Evidently Tas Hydro opens the valves to get high spot prices in the 15 minute NEM market. Meanwhile the aluminium, zinc and manganese alloy plants get a lot of imported brown coal power in their alleged 3c per kwh supply contracts. No way can NP be as cheap.. I think seawater cooling has to be most reliable. In France a couple of years ago river water proved inadequate (Loire Valley?) To my thinking SA should be the first to have NP since they have the uranium and need cheaper non fossil baseload power and cheap desalination for dry spells. If other States drag their feet on NP SA could export electricity in all weathers. During the 2009 heatwave in SA the HVDC substation in George Town blew a fuse (actually overheated thyristors I think) trying help power Adelaide air conditioners. Better if Adelaide was self reliant in heatwaves. That was rather the point of Basslink – to be able to provide peak load supply as well as being able to go to reverse to cover water shortages. Been useful both ways over the last few years. Seawater isn’t going to be as cold, and corrosion issues have to be dealt with. Especially if your suggestion of pump storage is in place, I can’t see the dams running dry. Certainly not without months to years of notice. As to nuclear power not being as cheap, my recollection is that the unit cost of nuclear power is a fraction (0.7, 0.8?) of a cent. That’s the driving force in those long term base contracts. I’m not going to argue against SA being first. Not going to stop me pushing where I can for it here either. Decarbonise TAS is not a bad idea. I’m struck by the eerie similarities between Germany and South Australia. I thought the Northern power station was to be semiretired not worked flat out. Both Germany and SA have to face high gas prices. Evidently CO2 penalties in either province (EU ETS, carbon tax) are not enough to overcome the cheapness of coal. Both Germany and SA talk green but act brown with troubling frequency. – the big bucks will be in export LNG from Gladstone. I understand that SA’s other declining gas source, the Vic onshore Otway Basin will never be fracked. Since the Japanese have been paying up to $17/GJ for LNG then domestic piped gas can’t be far behind, say $15 from the current $5. This is reflected In Figure 3.9 of the Energy White Paper that shows the gas price trebling between now and 2035. This means (ignoring carbon tax) the already expensive fuel source for nearly half SA’s electricity will treble in price within 20 years or so. Geez they’d better think of something hope it’s not coal.